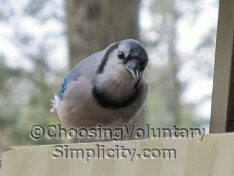 Home » Simply Personal / Voluntary Simplicity » What Do YOU See? As we approached our wooded area on Saturday morning during our daily walk, my eye was caught by something lying on the ground. From that distance I thought the something was a rather large piece of fabric, mostly because of the way the sunlight was emphasizing the distinct designs covering its entire surface. When we got closer we could see that the fabric was not fabric at all, but a very large piece of bark lying inner side up. 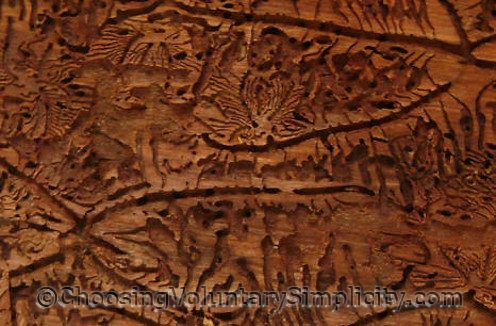 The bark was completely covered with hundreds of what looked like intricately carved designs… but which were actually a series of tiny grooves and channels made by years of insect damage. I showed this bark to people all weekend, and everyone who saw it was amazed at the beauty and complexity of the designs the insects had accidentally created. They really do look like carvings in the wood. The reactions have been interesting, because everyone sees something different in the designs. Almost everybody sees several big fish and one small whale. My husband sees a cat crouched under a bush ready to pounce on a giant squirrel! I see people standing in groups and even one person on a horse. Other people see a dog, butterflies, an owl, a tulip, a pterodactyl, a frog, and a monkey’s face. Like the pictures people see in clouds… everybody sees something different. I SEE THE CAT!!!!! Last picture bottom right – correct? AND THE SQUIRRELL! To the left of the cat standing up holding a nut. I see the fish, and the whale, and the pterodactyl. I also see the owl. And something you didn’t mention, I also see a fairly large galloping horse in the 2nd photo. Interesting post as always. That is so beautiful I would just have to frame it! Isn’t it amazing what nature can do. I, too, would frame a piece of the bark. eXquisite! Yes, I see the crowds of people. As well as a giraffe, an elephant and a Pharoah. I see a spider in the tree bark. I am 6 years old. I like your pictures. My mom likes your blog because it is where we got the vinegar cake recipe. She made one tonight. Wow! But, is it “accidental”? Maybe this is a way for the insects to communicate or to leave a record to others about their life, sort of like how we humans write blogs. It would make wonderful fabric! As a quilter, I would LOVE fabric like this! I wonder if your nature photographs could be “collected” into fabric lines? Wow, that is amazing. What a great find! Shows how we can find pleasure in the simple things. what did u end up doing with this bark? What do I see? Something beautiful created by nature. This is like me finding sparkly mica rocks during my trail walk; I hope you kept it.